Does Neptune have binary Trojans? Hi there! Jupiter, Uranus and Neptune are known to share their orbits with small bodies, called Trojans. This is made possible by a law of celestial mechanics, which specifies that the points located 60° ahead and behind a planet on its orbit are stable. Moreover, there are many binary objects in the Solar System, but no binary asteroid have been discovered as Trojans of Neptune. This motivates the following study, Dynamical evolution of a fictitious population of binary Neptune Trojans, by Adrián Brunini, which has recently been accepted for publication in The Monthly Notices of the Royal Astronomical Society. In this study, the author wonders under which conditions a binary Trojan of Neptune could survive, which almost means could be observed now. The coorbital resonance is a 1:1 mean-motion resonance. This means that the two involved bodies have on average the same orbital frequency around their parent one. In the specific case of the Trojan of a planet, these two objects orbit the Sun with the same period, and the mass ratio between them makes that the small body is strongly affected by the planet, however the planet is not perturbed by the asteroid. But we can have this synchronous resonance even if the mass ratio is not huge. For instance, we have two coorbital satellites of Saturn, Janus and Epimetheus, which have a mass ratio of only 3.6. Both orbit Saturn in ~16 hours, but in experiencing strong mutual perturbations. They are stable anyway. 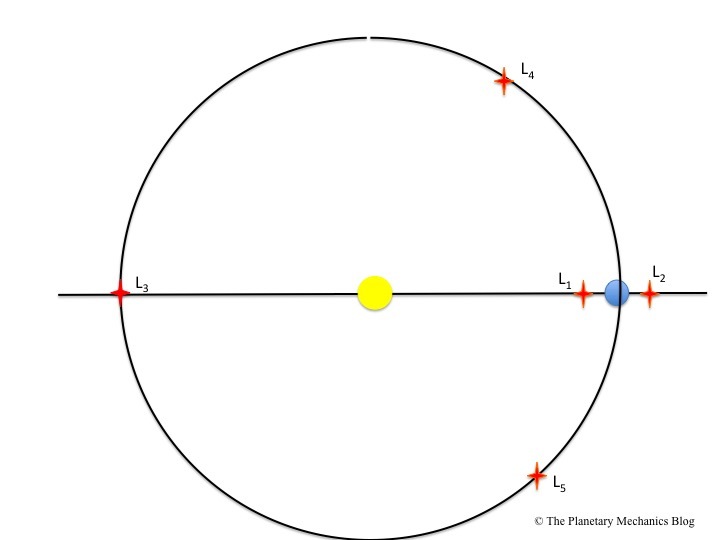 In the specific problem of the restricted (the mass of the asteroid is negligible), planar (let us assume that the planet and the asteroid orbit in the same plane), circular (here, we neglect the eccentricity of the two orbits) 3-body (the Sun, the planet and the asteroid) problem, it can be shown that if the planet and the asteroid orbit at the same rate, then there are 5 equilibriums, for which the gravitational actions of the planet and the Sun cancel out. 3 of them, named L1, L2 and L3, are unstable, and lie on the Sun-planet axis. The 2 remaining ones, i.e. L4 and L5, lag 60° ahead and behind the planet, and are stable. As a consequence, the orbits with small oscillations around L4 and L5 are usually stable, even if the real configuration has some limited eccentricity and mutual inclination. Other stable trajectories exist theoretically, e.g. horseshoe orbits around the point L4, L3 and L5. The denomination L is a reference to the Italian-born French mathematician Joseph-Louis Lagrange (1736-1813), who studied this problem. The Lagrange points, in a reference frame rotating with Neptune. At this time, 6,701 Trojans are known for Jupiter (4269 at L4 and 2432 at L5), 1 for Uranus, 1 for the Earth, 9 for Mars, and 17 for Neptune, 13 of them orbiting close to L4. As you can see, these are faint bodies, which have been discovered between 2001 and 2014. I have given here their provisional designations, which have the advantage to contain the date of the discovery. Actually, 2004 UP10 is also known as (385571) Otrera, a mythological Queen of the Amazons, and 2005 TO74 has received the number (385695). 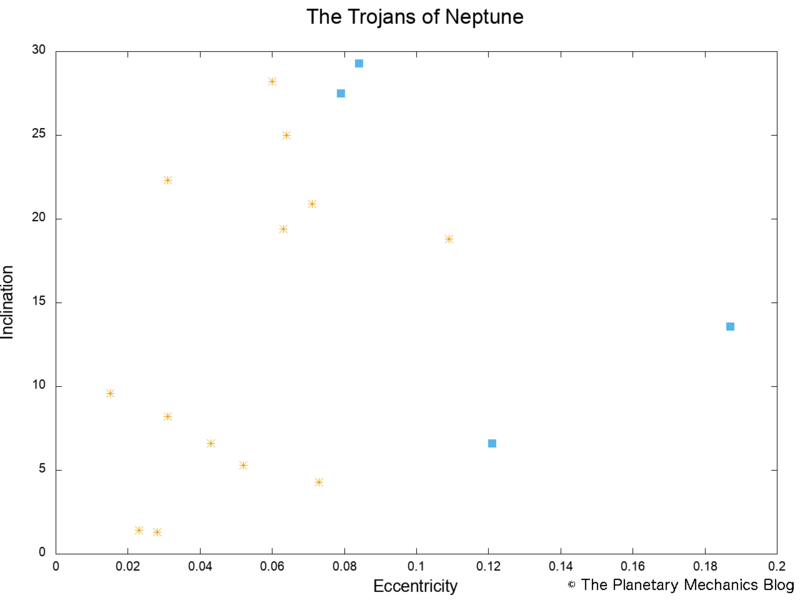 Dynamics of the Trojans of Neptune, at the Lagrangian points L4 and L5 (squares). Surprisingly, the 4 Trojans around L5 are outliers: they are the most two eccentric, the remaining two being among the three more inclined Trojans. Even if the number of known bodies may not be statistically relevant, this suggests an asymmetry between the two equilibriums L4 and L5. The literature has not made this point clear yet. In 2007, a study suggested an asymmetry of the location of the stable regions (here), but the same authors said one year later that this was indeed an artifact introduced by the initial conditions (here). In 2012, another study detected that the L4 zone is more stable than the L5 one. Still an open question… In the study I present today, the author simulated only orbits in the L4 region. A binary object is actually two objects, which are gravitationally bound. When their masses ratio is of the order of 1, we should not picture it as a major body and a satellite, but as two bodies orbiting a common barycenter. At this time, 306 binary asteroids have been detected in the Solar System. Moreover, we also know 14 triple systems, and 1 sextuple one, which is the binary Pluto-Charon and its 4 minor satellites. The formation of a binary can result from the disruption of an asteroid, for instance after an impact, or after fission triggered by a spin acceleration (relevant for Near-Earth Asteroids, which are accelerated by the YORP effect), or from the close encounter of two objects. The outcome is two objects, which orbit together in a few hours, and this system evolves… and then several things might happen. Basically, it either evolves to a synchronous spin-spin-orbit resonance, i.e. the two bodies having a synchronous rotation, which is also synchronous with their mutual orbit (examples: Pluto-Charon, the double asteroid (90) Antiope), or the two components finally split… There are also systems in which only one of the components rotates synchronously. Another possible end-state is a contact binary, i.e. the two components eventually touch together. At this time, 4 binary asteroids are known among the Trojans asteroids of Jupiter. None is known for Neptune. The author considered fictitious binary asteroids close to the L4 of Neptune, and propagated the motion of the two components, in considering the planetary perturbations of the planets, over 4.5 Byr, i.e. the age of the Solar System. A difficulty for such long-term numerical studies is the handling of numerical uncertainties. Your numerical scheme includes a time-step, which is the time interval between the simulated positions of the system, i.e. the locations and velocities of the two components of the binary. If your time-step is too large, you will have a mathematical uncertainty in your evaluation. However, if you shorten it, you will have too many iterations, which means a too long calculation time, and the accumulations of round-off errors due to the machine epsilon, i.e. rounding in floating point arithmetic. A good time step should be a fraction of the shortest period perturbing the system. Neptune orbits the Sun in 165 years, which permits a time step of some years, BUT the period of a binary is typically a few hours… which is too short for simulations over the age of the Solar System. This problem is by-passed in averaging the dynamics of the binary. This means that only long-term effects are kept. In this case, the author focused on the Kozai-Lidov effect, which is a secular (i.e. very long-term) raise of the inclination and the eccentricity. Averaging a problem of gravitational dynamics is always a challenge, because you have to make sure you do not forget a significant contribution. The author also included the tidal interaction between the two components, i.e. the mutual interaction triggering stress and strain, and which result in dissipation of energy, secular variation of the mutual orbits, and damping of the rotation. He considered three sets of binaries: two with components of about the same size, these two samples differing by the intensity of tides, and in the third one the binary are systems with a high mass ratio, i.e. consisting of a central body and a satellite. The authors find that for systems with strong tides, about two thirds of the binaries should survive. The tides have unsurprisingly a critical role, since they tend to make the binary evolve to a stable end-state, i.e. doubly synchronous with an almost circular mutual orbit. However, few systems with main body + satellite survive. At this time, no binary has been found among the Trojans of Neptune, but this does not mean that there is none. The next years shall tell us more about these bodies, and once they will be statistically significant, we would be able to compare the observations with the theory. An absence of binaries could mean that they were initially almost absent, i.e. lack of binaries in that region (then we should explain why there are binaries in the Trans-Neptunian population), or that the relevant tides are weak. We could also expect further theoretical studies, i.e. with a more complete tidal dynamics, and frequency-dependent tides. Here, the author assumed a constant tidal function Q, while it actually depends on the rotation rate of the two bodies, which themselves decrease all along the evolution. So, this is a model assisting our comprehension of the dynamics of binary objects in that region. As such, it should be seen as a step forward. Many other steps are to be expected in the future, observationally and theoretically (by the way, could a Trojan have rings?). Hi there! Did you know that an asteroid could be resonant and in polar orbit? Yes? No? Anyway, one of them has been confirmed as such, i.e. this body was already discovered, known to be on a polar orbit, but it was not known to be in mean-motion resonance with Neptune until now. This is the opportunity for me to present you First transneptunian object in polar resonance with Neptune, by M.H.M. Morais and F. Namouni. This study has recently been accepted for publication in The Monthly Notices of the Royal Astronomical Society. The planets of the Solar System orbit roughly in the same plane. In other words, they have small mutual inclinations. However, asteroids are much more scattered, and can have any inclination with respect to the ecliptic, i.e. the orbital plane of the Earth, even if low inclinations are favored. the inclination, which is the angle between the ecliptic and the orbital plane. It varies between 0° and 180°. So, an almost planar orbit means an inclination close to 0° or close to 180°. Orbits close to 0° are prograde, while orbits close to 180° are retrograde. However, when your inclination is close to 90°, then you have a polar orbit. There are prograde and retrograde polar orbits, whether the inclination is smaller (prograde) or larger (retrograde) than 90°. These bodies carry in their names their year of discovery. As you can see, the first of them has been discovered only 15 years ago. We should keep in mind that TNOs orbit very far from the Earth, this is why they are so difficult to discover, polar or not. The last of them, 2017 CX33, is so recent that the authors did not study it. A recent discovery induces a pretty large uncertainty on the orbital elements, so waiting permits to stay on the safe side. 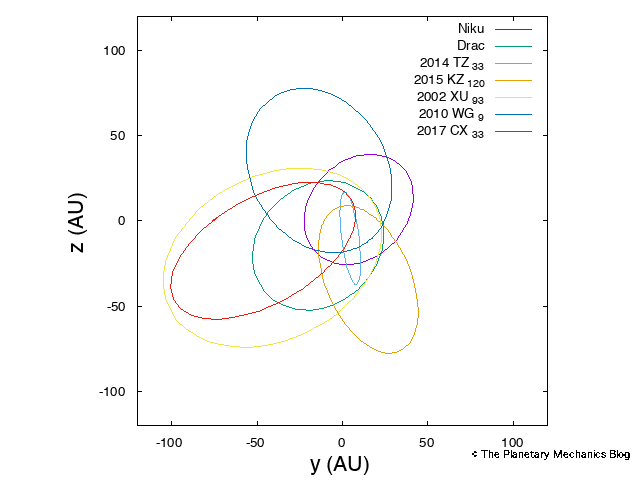 Among the 6 remaining, 4 (Niku, Drac, 2002 XU93 and 2010 WG9) share (very) roughly the same orbit, 2 of them being prograde, while the others two are retrograde. This happened very unlikely by chance, but the reason for this rough alignment is still a mystery. Orbits of the polar TNOs, in the x-y plane. Orbits of the polar TNOs, in the y-z plane. The study I present you today investigated the current dynamics of these bodies, and found a resonant behavior for one of them (Niku). It usually translates into an integer combination of the fundamental frequencies of the system (orbital frequencies, frequencies of precession of the nodes and pericentres), which is null, and this results in an integer combination of angles positioning the asteroid of the planet, which oscillates around a given number instead of circulating. In other words, this angle is bounded. Another point of interest is how the asteroid has been trapped into the resonance. A resonance is between two interacting bodies, but the mass ratio between an asteroid and a planet implies that the planet is insensitive to the gravitational action of the asteroid, and so the asteroid is trapped by the planet. The fundamental frequencies of the orbital motion are controlled by the semimajor axes of the two bodies, so a trapping into a resonance results from a variation of the semimajor axes. Models of formation of the Solar System suggest that the planets have migrated, this could be a cause. Another cause is close encounters between planets and asteroids, which result in abrupt changes in the trajectory of the asteroid. And this is probably the case here: Niku got trapped after a close encounter. The authors used both numerical and analytical methods to get, understand, and secure their results. 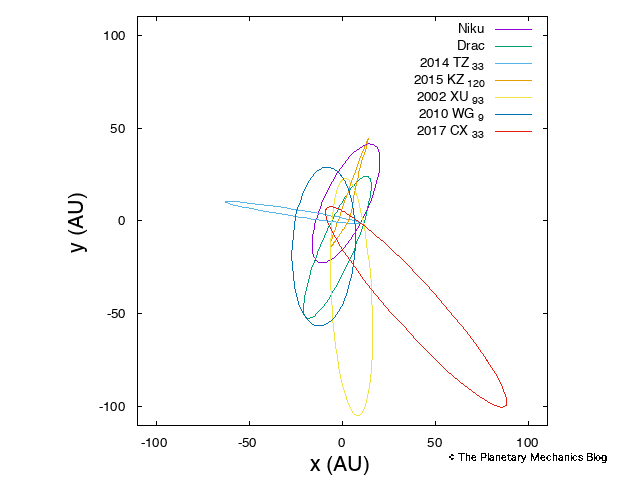 The authors ran long-term numerical simulations of the orbital motion of the 6 relevant asteroids, perturbed by the planets. They ran 3 kinds of simulations: 2 with different integrators (algorithms) over 400 kyr and 100 Myr and 8 planets, and one over 400 Myr and the four giant planets. With less planets, you go faster. Moreover, since the inner planets have shorter orbital periods, removing them allows you to increase the time-step, and thus go further in time, inward and backward. In each of these simulations, the authors cloned the asteroids to take into consideration the uncertainty on the orbital elements. They used for that a well-known devoted code, MERCURY. Numerical studies give you an idea of the possible dynamical states of a system, but you need to write down equations to fully understand it. Beside these numerical simulations, the authors wrote a dynamical theory of resonant polar orbits, in another paper (or here). This consists in reducing the equations to the only terms, which are useful to reproduce the resonant dynamics. For that, you keep the secular variations, i.e. precessions of the nodes and pericentres, and the term involving the resonant argument. This is a kind of averaged dynamics, in which all of the small oscillations of the orbital elements have been dropped. To improve the relevance of the model, the authors used orbital elements which are based on the barycenter (center of mass) of the whole Solar System instead on the Sun only. This is a small correction, since the barycenter is at the edge of the Sun, but the authors mention that it improves their results. Niku, i.e. (471325) 2011 KT19, is trapped into a 7:9 mean-motion resonance with Neptune. In other words, it makes 7 revolutions around the Sun (sorry: the barycenter of the Solar System) while Neptune makes 9. More precisely, its resonant argument is φ=9λ-7λN-4ϖ+2Ω, where λ and λN are the mean longitudes of the asteroid and of Neptune, respectively, ϖ is the longitude of its pericenter, and Ω is the one of its ascending node. Plotting this argument shows a libration around 180°. Niku has been trapped in this resonance after a close encounter with Neptune, and should leave this resonance in 16±11 Myr. This means that all of the numerical simulations involving Niku show a resonant object, however they disagree on the duration of the resonance. Their might be another resonant object: a few simulations suggest that Drac, i.e. 2008 KV42 is in a 8:13 mean-motion resonance with Neptune. Another study on the orbits of the polar asteroids (or here). The IAU page of Fathi Namouni. Hi there! Today I will tell you on the discovery that an already known Trans-Neptunian Object is in fact probably a contact binary. This is the opportunity for me to present you 2004 TT357: A potential contact binary in the Trans-Neptunian Belt by Audrey Thirouin, Scott S. Sheppard, and Keith S. Noll. This study has recently been published in The Astrophysical Journal. As suggested by its name, 2004 TT357 was discovered in 2004. More precisely in August by a team led by Marc W. Buie, at Kitt Peak Observatory, Arizona, USA, on the 4-m Mayall telescope. From its magnitude, its radius is estimated to be between 87 and 218 km, depending on the albedo of the asteroid, i.e. the fraction of Solar light which is reflected by its surface. This albedo is unknown. You can find below its orbital elements. These elements show that 2004 TT357 is in a 5:2 mean-motion resonance in Neptune, i.e. it performs 2 revolutions around the Sun while Neptune makes 5. This makes 2004 TT357 a Scaterred Disc Resonant Object. Its high eccentricity is probably at least partly due to this resonance. In astronomy, a binary object is a group of two objects, which are so linked together that they orbit around a common barycenter. Of course, their separation is pretty small. There are binary stars, here we speak about binary asteroids. A contact binary is a kind of extreme case, in which the two components touch each other. In some sense, this is a single object, but with two different lobes. This was probably a former classical binary, which lost enough angular momentum so that the two objects eventually collided, but slowly enough to avoid any catastrophic outcome. It is thought that there is a significant fraction of contact binaries in the Solar System, i.e. between 5% and 50%, depending on the group you are considering. Characterizing a known object as a contact binary is not an easy task, particularly for the Trans-Neptunian Objects, because of their distance to us. Among them, only (139775) 2001 QG298 is a confirmed contact binary, while 2003 SQ317 and (486958) 2014 MU69 are probable ones. This study concludes that 2004 TT357 is a probable one as well. Lowell Observatory is located in Flagstaff, Arizona, USA. It has been founded by Percival Lowell in 1894, and among its achievements is the discovery of the former planet Pluto in 1930, by Clyde Tombaugh. Currently, the largest of its instruments is the 4.3-m Discovery Channel Telescope (DCT), which has been partly funded by Discovery Communications. 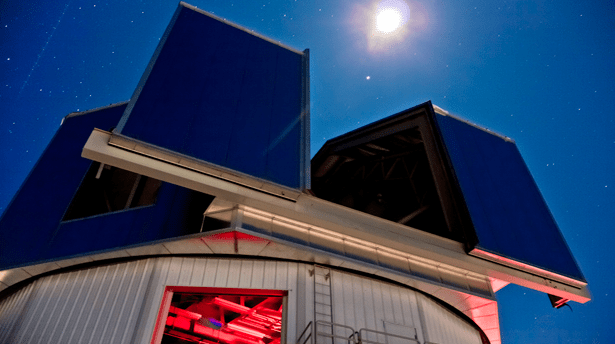 This telescope has its first light in April 2012, it is located in the Coconino National Forest near Happy Jack, Arizona, at an altitude of 2,360 meters. 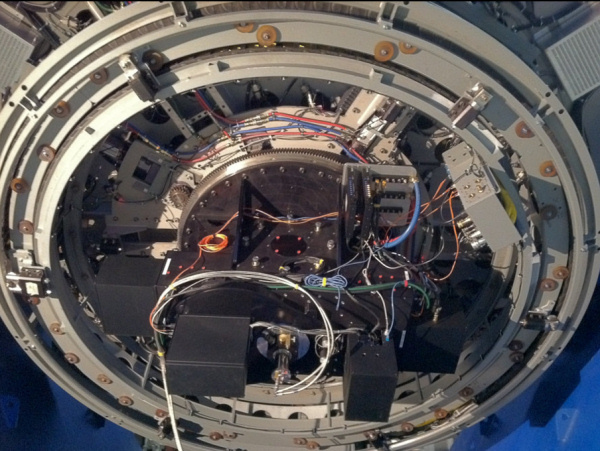 The authors used this telescope, equipped with the Large Monolithic Imager (LMI). They acquired two sets of observation, in December 2015 and February 2017, during which they posed during 600 and 700 seconds, respectively. 2004 TT357 had then a mean visual magnitude of 22.6 and 23, respectively. You can find below the photometric measurements of 2004 TT357. The first set of observations. The measurements are represented with the uncertainties. The second set of observations. The measurements are represented with the uncertainties. 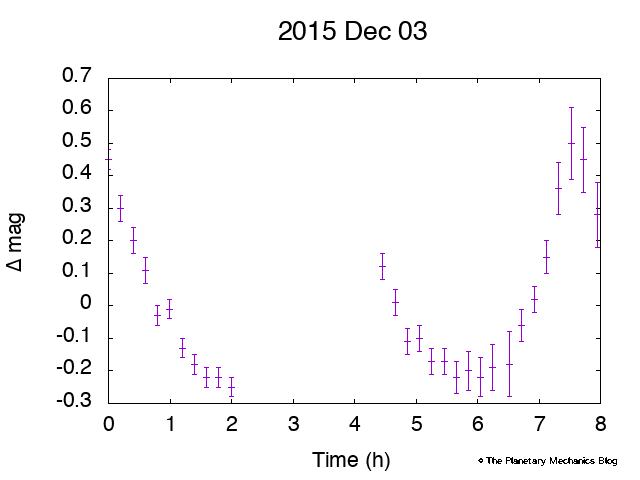 We can see pretty significant variations of the incoming light flux, these variations being pretty periodic. 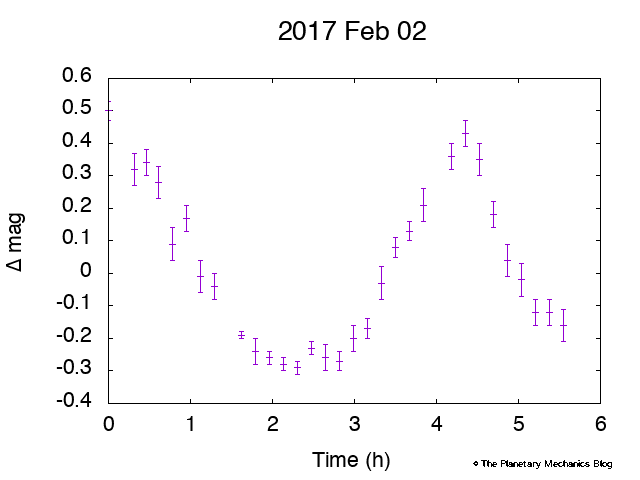 This periodicity is the signature of the rotation of the asteroid, which does not always present the same face to the terrestrial observer. From these lightcurves, the authors measure a rotation period of 7.79±0.01 h. From the curves, the period seems twice smaller, but if we consider that the asteroid should be an ellipsoid, then its geometrical symmetries tell us that our line of sight should be aligned twice with the long axis and twice with the short axis during a single period. So, during a rotation period, we should see two minimums and two maximums. This assumes that we are close to the equatorial plane. Another interesting fact is the pretty high amplitude of variation of the incident light flux. If you are interested in it, go directly to the next section. Before that, I would like to tell you how this period of 7.79±0.01 h has been determined. the phase dispersion minimization (PDM). Usually periodic signals are described as sums of sinusoids, thanks to Fourier transforms. Unfortunately, Fourier is not suitable for unevenly-spaced data. The Lomb (or Lomb-Scargle) periodogram technique consists to fit a sinusoid to the data, thanks to the least-squares method, i.e. you minimize the squares of the departure of your signal from a sinusoid, in adjusting its amplitude, phase, and frequency. PDM is an astronomical adaptation of data folding. You guess a period, and you split your full time interval into sub-intervals, which duration is the period you have guessed. Then you superimpose them. If this the period you have guessed is truly a period of the signal, then all of your time intervals should give you pretty the same signal. If not, then the period you have guessed is not a period of the signal. Let us go back now to the variations in the amplitude. Two bodies, i.e. a binary. The albedo quantify the portion of Solar flux, which is reflected by the surface. Here, the variations are too large to be due to the variations of the albedo. As a consequence, 2004 TT357 is probably a binary, with a mass ratio between 0.4 and 0.8. Hubble Space Telescope observed 2004 TT357 in 2012, and detected no companion, which means it is probably a contact binary. Another way to detect a companion is the analysis of a stellar occultation (see here). Fortunately for us, one will occur in February 2018. On 5 February 2018, 2004 TT357 shall occult the 12.8-magnitude star 2UCAC 38383610, in the constellation Taurus, see here. This occultation should be visible from Brazil, and provide us new data which would help to determine the nature of 2004 TT357. Are you interested to observe? The study, freely available in its published state, which means that the authors paid extra fees to share it with us. Many thanks to them! You can also download the text from arXiv. The one of Keith S. Noll. The occultation of 2UCAC 38383610 by 2004 TT357, in February 2018. Hi there! Today’s post is on the paper Results from the 2014 November 15th multi-chord stellar occultation by the TNO (229762) 2007 UK126, by Gustavo Benedetti-Rossi and 28 colleagues, which has recently been published in The Astronomical Journal. It explains us what 22 simultaneous observations of the same event, i.e. the occultation of a star by an asteroid, tell us about this asteroid. (229762) 2007 UK126 is a Trans-Neptunian Object, which was discovered in October 2007. Its highly eccentricity orbit (0.49) makes it a probable scattered disc object, i.e. its eccentricity should have been pumped by the planets, in particular Neptune. Its estimated rotation period is 11.05 hours. The Hubble Space Telescope has revealed the presence of an orbital companion. Even at its perihelion, this object is further than Neptune, which makes it difficult to observe. The stellar occultations permit to bypass this problem. The idea is this: while a pretty dark object passes just between you and a star, you do no see the star anymore. The dark object occults it. This occultation contains information. This is the reason why some planetary scientists try to predict occultations from simulations of the motion of asteroids in the sky, maintaining lists of such events. These predictions suffer from uncertainties on the orbit of the asteroid, this motivates the need to refine the predictions just before the predicted event. For that, astrometric observations of the object are performed, to better constrain its orbital ephemerides. Once the occultation is predicted with enough accuracy, the observers are informed of the date and the places from where to observe. Multiple observations of the same event, at different locations, represent a set of data which will then be inverted to get information on the asteroid. For these observations to be conducted, amateur astronomers are solicited. They usually constitute networks, which efficiency is doped by their enthusiasm. The observation of a stellar occultation consists to measure the light flux received from the star during a time interval which includes the predicted event, and when the occultation happens, then a flux drop should be registered. For an observation to be useful, the observer should take care to have an accurate time reference. Moreover, a clear sky, preferably with no wind, makes the measurements more accurate. Some flux drops could be actually due to clouds passing by! What can these observations tell us? The first information we get from these occultations addresses the motion of the asteroid: the date and length of the occultation is an information, because we know where the asteroid was on the celestial sphere when this happened. When no occultation is detected, this is an information as well, even if it is frustrating. Observing at different places permits to observe the occultation of the star by different parts of the asteroid. This is called a multi-chord occultation. From the duration of the event, we can deduce the size of the object with a much better accuracy than direct observation. Such a technique could also detect companions, as it might have been the case for the Main-Belt asteroid (146)Lucina in 1982. A compelling information on a planetary body is its mass. The best way to measure its mass is by observing the orbit of a companion, if there is one. If there is none, or if its orbit cannot be observed, then we can combine the different measurements of its radius with the measurement of its rotation period and the assumption that its shape is at an hydrostatic equilibrium, i.e. a balance between its own gravity, its rotation, and possibly the gravitational (tidal) attraction of a planetary companion. In the absence of a companion, the equilibrium figure is an oblate, MacLaurin spheroid, which has a circular equatorial section, and a rotation axis which is smaller than the two other ones. If a companion is involved, then the object could be a Jacobi ellipsoid, i.e. an ellipsoid with 3 different principal axes. This study gathers the results of 20 observations of the stellar occultation of the star UCAC4 448-006503 by the TNO (229762) 2007 UK126 in November 2014, all over the United States, and 2 negative observations, i.e. no flux drop measured, in Mexico. One of the difficulties is is to be accurate on the exact times of the beginning (ingress) and the end (egress) of the event, i.e. the star disappearance and reappearance. This is the reason why the authors of the study split into two teams, which treated the same data separately, with their own techniques (denoted GBR and MWB, since conducted by Gustavo Benedetti-Rossi and Marc W. Buie, respectively). This table tells us that, before the occultation, only a mean radius was known, and with a much larger uncertainty than now. It also tells us that assuming the asteroid to be circular instead of elliptical gives a larger uncertainty. Wait… why circular and not spherical? Why elliptical and not ellipsoidal? Because the occultation is ruled by the projection of the shape of the asteroid on the celestial sphere, which is a 2D surface. So, we observe a surface, and not a volume, even if our assumptions on the shape (remember, the MacLaurin spheroid) give us a 3D information. This is why the oblateness is just an apparent oblateness. It is actually biased by the projection on the celestial sphere. This oblateness is defined by the quantity (a-b)/a, where a and b are the two axes of the projected asteroid, with a > b. You can find the study on the web site of The Astronomical Journal. It has also been freely made available by the authors on arXiv. Thanks to the authors for sharing! Here is the webpage of the RECON and IOTA networks, which were of great help for the observations. I hope you enjoyed this post. As usual, please let me know what you think about it. Happy holidays to everybody, and see you soon!